It's very rare that we find ourselves summoned down to Harrods in Knightsbridge for a phone release. But such was the case with the Porsche Design BlackBerry P'9983. The environment is well suited; this is a premium BlackBerry model, aimed at those for which a mere iPhone 6 or LG G3 alone won't fit the bill. And yet, compared to the likes of the handmade £6,750 Vertu Signature Touch, the £1,400 asking price doesn't seem so steep. This is Porsche Design's third BlackBerry handset, following last year's BlackBerry P'9982 - essentially a pimped BlackBerry Z10. This time around, its the BlackBerry Q10 that's been given the luxury treatment and with it, comes the return of the keyboard - BlackBerry's perennial calling card. But if you're hoping for substantial new features, well, there aren't any. Internally, the phone remains exactly the same. It benefits from the latest version of the Blackberry 10 OS but then again, there's the forthcoming BlackBerry Passport to blow that particular tumpet. What we've got here then, is just a nicer-looking BlackBerry Q10 with premium branding and a massive price bump. There's no mistaking that the design and build is where the £1,400 price tag comes into play. Porsche Design has, to all intents and purposes, taken the BlackBerry Q10 and given the chassis a serious overhaul. The familair stainless steel machined Porsche Design logo is stamped above the 3.1-inch screen. The same stainless steel edging is in effect around the handset, transforming the curved appearance of the BlackBerry Q10 into something much more angular. The design company pulled a similar trick with last year's P'9882. The weight of the handset remains pretty much the same, increasing slightly to 140g from the Q10's 139g. BlackBerry devices were always noted for the keyboard and it's here that Porsche Design has shown some love. The P'9883 features glass-like PMMA plastic for increased durability and the design company has shaped the keys to create a pseudo 3D-like effect. And there's a nice new silver font too. The raised buttons are comfortable to type on, but some quick test emails revealed that we've become too used to wide touchscreens - the cramped 'board takes some getting used to but there's a decent amount of travel on the keys. Round the back, Porsche Design has coated the device with a "special glass-weave technology" that looks nice enough, but is immediately covered with smears and fingerprint marks. Which is a shame given how much you're asked to part with for it. And yet, it's a sturdy, well-built phone. The silver and black blend obviously looks the business, and will find a nice home in the breast pocket of your Savile Row suit. This is the reason the phone is what it is - if you're of a particular income bracket and partial to an association with German automotive design, then you're going to like this device. 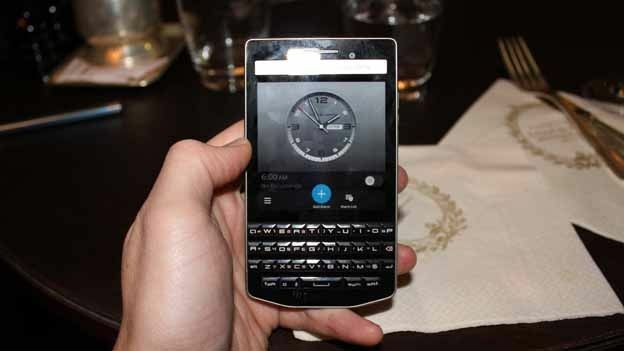 New features were awarded barely a mention during the reveal at Harrods, and chiefly rely on the updates to BlackBerry's operating system. Unfortunately, all you're going to get with this phone is a different font and the silver, executive-style Porsche Design clock. There's also a particular PIN ID designation with BlackBerry Messenger that identifies you as a Porsche Design user. Around back is the 8MP camera that Porsche Design has equipped with a sapphire crystal coated lens. A small array of features, included burst mode, panorama and time shift are there to play with, but really it's not up to the likes of the HTC One M8 in the photography department. The square 3.1-inch display boasts a 720 x 720 resolution that is clearly designed for the email and spreadsheet mentality than taking in a TV series on the commute home. If the black and silver look is a little too boardroom for you, you can add one of Porsche Design's handcrafted leather cases to the P'8893. They come in a range of colours, including yellow, orange, salsa blue, pomegranate, dark brown paloma grey and blue green. Performance is handled by the same dual core 1.5GHz Snapdragon processor found in the original Q10, although, like the P'9982, Porsche Design has given the internal storage a boost. The original 16GB has been upgraded to 64GB and you can still use a microSD card to add even more. There's 2GB of RAM, keeping things moving quickly, and a 2,100 mAh battery that, BlackBerry says, will afford you 14 hours of talk time. Part of the work that the company has done on the operating system is to make it more power efficient and the representatives we spoke to at the launch were pretty confident you could get a day and a half's use out of the device between charges. This is a phone being sold on its brand image alone, and to a very specific type of customer. BlackBerry, by its own admission, says this isn't going to be a mass-market phone. It's aiming to bring back the business love by way of a decent keyboard and supurb build quality. In the hand, it feels suitably premium - but then, so does the HTC One M8. The inclusion of the Amazon App Store goes some way to remedying the worrying lack of apps that has always plagued BlackBerry and the edgy design is more mature and appealing than the curvyness of the original BlackBerry Q10. It would have been nice if Porsche Design had something in the way of third-party apps or services that could set this phone aside in a software sense as well as a hardware sense. Ultimately though, you're going to want this phone in order to make a particular statement. It's a designer phone in the same way as there are designer sunglasses, watches and jackets. It's branding has little to no impact on the actual performance or usability of the phone - which still falls some way behind Apple's iPhone 6 or the top Android handsets. This isn't going to be the phone that reinvents BlackBerry, but it does stand as a testament to the fact there are still customers out there that value exclusivity above all else. And to them, we say happy shopping.